WASHINGTON — President Barack Obama found common cause with the leader of Singapore in the face of growing political headwinds against the Trans-Pacific Partnership, warning that to “pull up a drawbridge” on trade would only hurt the United States and its workers. 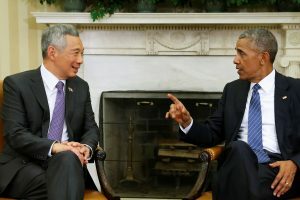 Singaporean Prime Minister Lee Hsien Loong urged the United States to maintain its “indispensable role” in the Asia-Pacific and ratify the TPP as he joined Obama at the White House to celebrate the 50th anniversary of U.S. diplomatic relations with the Southeast Asian city state. Obama said that people have legitimate fears about the impact of globalization and being “left behind” but the answer cannot be to back away from trade and the global economy. “To try to pull-up a drawbridge on trade would only hurt us and hurt our workers. The answer is to make sure that globalization and trade is working for us and not against us,” Obama told joint news conference after talks with Lee in the Oval Office. “TPP is designed to do precisely that,” Obama added. Singapore, a close U.S. partner, is one of the 12 nations in the TPP, an agreement key to Obama’s effort to boost U.S. exports and build strategic ties in Asia. But Lee’s Washington visit comes as opposition to the TPP intensifies in the United States. Republican presidential nominee Donald Trump and his Democratic rival Hillary Clinton are both against it. Calling Singapore a “rock solid” partner, Obama welcomed Lee after an elaborate ceremony on the South Lawn of the White House, where hundreds of U.S. military members in blue and white uniforms formed an honor guard. Lee will also be honored with a state dinner on Tuesday evening. On his arrival at the White House, Lee also acknowledged that some Americans are anxious and frustrated with economic uncertainty and the uneven result of globalization and trade, but said the U.S. is strengthened by its engagement in Asia. “Singapore fervently hopes that the U.S. will stay engaged and maintain its indispensable role in the Asia-Pacific. In particular, we hope, and I’m sure the president shares this hope, that Congress will ratify the TPP soon,” Lee said. The Obama administration says it remains determined to try and win congressional approval for TPP, but the chances of achieving that in the “lame duck” session after the Nov. 8 election and before the new president takes office Jan. 20 appear slim because of the depth of political opposition, not least from Obama’s fellow Democrats. Obama said he was ready to sit down publicly with people on both the right and left of the political spectrum to go through provisions of TPP to address “misinformation” about the agreement. The deal would eliminate trade barriers and tariffs, streamline standards and encourage investment between the 12 countries that include Mexico, Japan, Vietnam and Australia. But critics say the pact undercuts American workers by introducing lower-wage competition and gives huge corporations too much leeway. Singapore, a city state of 5.7 million people, is heavily dependent on international trade for its prosperity. In 2004, it became the first Asian nation to strike a bilateral free trade agreement with the U.S. Last year, the bilateral trade in goods totaled $47 billion, with the U.S. enjoying a $10 billion surplus. Singapore is also a strong advocate of the U.S. security role in Asia although it retains cordial ties with China too. Under Obama, the U.S. has deployed littoral combat ships in Singapore, and last December, deployed a P-8 Poseidon spy plane there for the first time, amid heightened tensions in the South China Sea. Lee’s meeting with Obama on Tuesday will be watched for reaction to an international tribunal ruling July 12 that invalidated China’s historical claims to most of the disputed South China Sea. The U.S. says the ruling is binding but China has rejected it. Southeast Asian nations have been reluctant to speak out against Beijing. The state dinner for Lee will be the first held for a Singaporean leader since October 1985, when Ronald Reagan hosted Lee’s father, Prime Minister Lee Kuan Yew. The U.S. and Singapore opened diplomatic relations in 1966, a year after the U.S. recognized Singapore’s independence from Malaysia.